What do I say about a bike/frame that I’ve been given to ride? What if I hate it? What if I just don’t get on with it. It just doesn’t feel right? I did wonder that when I stood in my kitchen at 23:15 on Friday night, sipping a tumbler of Bowmore and admiring my handy work. A phone call from Al over at Garage at around 15:00 had me diving out of the office as early as I could get away with. Unpacking the frame, the bright “sick” green shone out from the cardboard, despite the opaque bubblewrap protection. It certainly isn’t subtle. Luckily, I don’t really do subtle. -wow, it’s light. The full build as pictured is 19lbs. -that lightness translates into a fantastic bike for climbing on. -I currently have 710mm bars fitted – wider than I anything I used until a few years ago, but times have changes. They are now the narrowest bars I own, and I miss the greater leverage of an extra few mm either side. Again, for pure xc duties, this is not an issue, but as an all-rounder, I think I want to go wider. The Kinesis Strut bars have caught my eye, and will allow me to gain the extra width without sacrificing low weight. Thanks for your first impressions! I’m curious about how the Kinesis frame compares to the Planet-X Dirty Harry. I know the DH is made from carbon, but they are in the same price category. What are your impressions? Hey Erik. Thanks for the question. 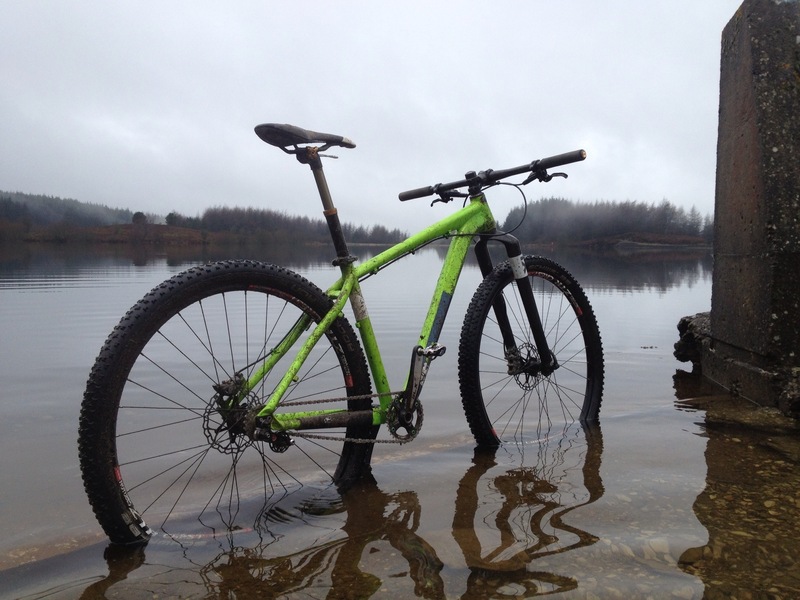 Yes, different frame materials, and quite different bikes, despite both being 29ers. I’d first of all say that I think both are very good and you’d not be disappointed with either. Generally, I’d say the FF29 is more of an all-rounder, it is a superb “trail bike” and excellent fun, to the point that I’ve only ridden my full suspension bike once since getting it. I’ve currently got it set up with rigid carbon forks, which are great, but I’d like to try it with some suspension upfront, as I reckon it will amplify a lot of the playfulness of the bike. The Planet X feels to me more like a traditional XC bike, which is no bad thing. My only criticism of it is that the rear stays felt a little flexy. This made it comfortable, but it sometimes felt a bit sluggish when accelerating. I’ll be using the FF29 for a bit of everything this year, including xc, and it builds up nice and light. I’m definitely not missing the DH, so I guess that’s my answer!